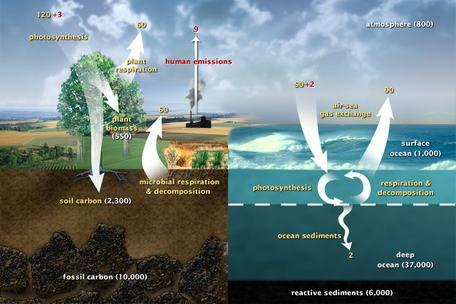 Users of this Earth Science Investigation engage with eight CLEAN, NASA, and NOAA resources in a four-step learning sequence to investigate cycling of carbon dioxide among the hydrosphere, atmosphere, geosphere, and biosphere. Through the course of the guided investigation users view short video clips, analyze CO2 data, do hands-on experiments, and work with several interactive models. In the final step, students do a summative performance assessment to communicate their results and conclusions using interactive and physical models to illustrate the cycling of carbon in Earth systems. They use an interactive online resource to produce a single carbon pathway and then combine their results on a large poster in their classroom to construct a visual model of the carbon cycle.